*Conditions for Guaranteed Trade Value (GTV) Offer: Trade in value is the ride away price of the Yamaha R3A $5,890 – Yamaha R3ASP $5,990, less dealer delivery fees and government on road costs. Therefore $4,670 R3A or $4,770 R3ASP respectively, is the Guaranteed Trade-in Value (GTV) and this will be the trade in value subject to the following conditions. Offer available when you purchase a new MY18 Yamaha R3 before April 30, 2019 or whilst current stock lasts from TeamMoto. The Guaranteed Trade Value (GTV) is defined as the cost of the motorcycle as stipulated on the purchase contract (Price Including GST), less dealer delivery fees and government on road costs. This does not include parts, accessories, fitting labour and apparel purchased with the motorcycle. The full guaranteed future value will be offered if the motorcycle is traded at any time up to twenty four months, and meets the stipulations outlined in these terms and conditions, less delivery fees and government on road costs. And has been serviced as per the manufacturer service schedule at the dealership it was purchased from and is in full operating roadworthy condition without cosmetic damage (excluding normal wear and tear). If the motorcycle does not meet these requirements it will not be eligible for the Guaranteed Trade Value offer. 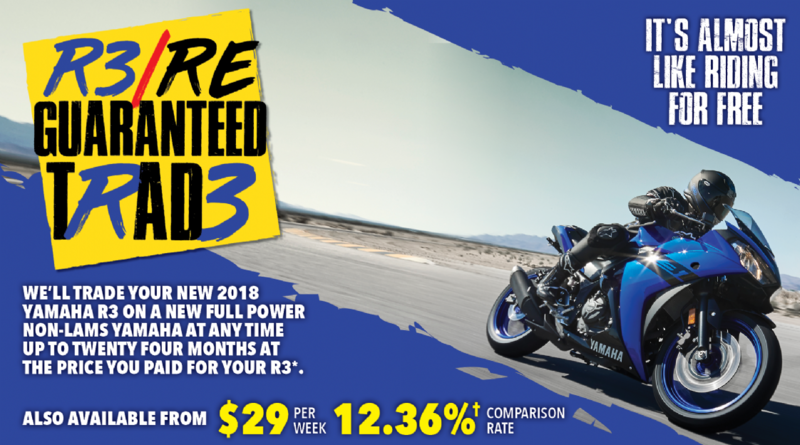 The Yamaha R3 can be traded up to any Yamaha full-power non-lams model at the Manufacturers Recommended Ride Away Price. Offer commences April 10, 2019. The Yamaha R3 motorcycle must be purchased and delivered by April 30th, 2019 or whilst current stock lasts from TeamMoto. The Guaranteed Trade Value must be claimed within 24 months of the purchase date, as stipulated on the Guaranteed Trade Value Claim Card that will be received at the time of purchase. Not valid with any other Offer. Offer available to purchasers using either cash or finance. *XSR700 matches future tech with retro style for an entertaining ride with attitude to burn. With deep torque and a super agile chassis, itÃ¢â‚¬â„¢s for those who appreciate heritage without the hassle. This 655cc model is unique to Australia with power delivery specially maximised for our LAMs market, and now it's more affordable than ever, with $1500 saving off the RRP. Hurry into your local Yamaha dealer today. Offer ends 30th June 2019, while stocks last. *For a limited time, receive a $1000 factory saving plus a free CDR Monster Energy #1 sticker kit when you purchase a YZ450F! CDR Yamaha Monster Energy's MX1 Champion, Dean Ferris, dominated the 2018 MX Nationals, claiming his 3rd consecutive championship with 10 round wins. In order to celebrate this success, Yamaha is offering $1000 factory bonus and a free #1 CDR Yamaha Monster Energy sticker kit on the race winning 2018 YZ450F. Hurry into your local Yamaha dealer today, while stocks last. *The Yamaha YZF-R3 has been dominating the lightweight supersport category in 2018, claiming the top 3 positions in the Australian Supersport 300 championship. Here is your chance to get on a race winning machine with a saving of $1250 on all colours and variants of 2018 and earlier YZF-R3s. Hurry into your local Yamaha dealer today. Offer ends 30th June 2019, while stocks last. *The Yamaha MT range has been a huge success since inception and there is no better time than now to get onto a high torque model. For a limited time, Yamaha is offering monster savings on selected 2018 and earlier models, from the entry level LAMs approved MT-03 to the ultimate torque monster MT-10SP. Hurry into your local Yamaha dealer today. Offer ends 30 June 2019, while stocks last.